I’m a couple days late posting this, but let me start out by saying that The Moth and Me, the fabulous blog carnival dedicated to our most favourite lepidopterans, has returned after a short three-month winter hibernation. 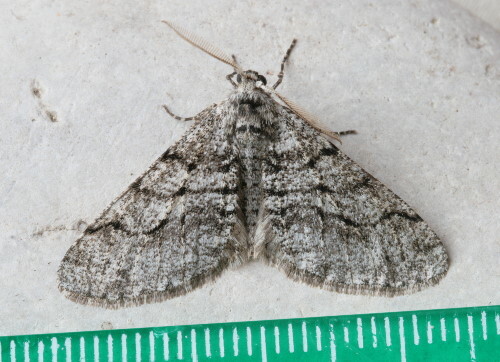 In TMaM #9, Jason at Xenogere has treated us to an enjoyable recounting of a chance encounter with a female Woolly Gray, Lycia ypsilon (check it out to see why this is memorable! ), and along the way shared a dozen excellent mothy posts. I’m looking for hosts for April and onward! Interested? Drop me a line at sanderling [at] symbiotic [dot] ca to say which month you’d like to host. Outside, our local moths have also made a return with the warm weather. Although I haven’t been seeing as many this year as I was at this time last year, I don’t know if it’s because of weather patterns or just the change in location. Even still, I’ve been getting a pretty good assortment to my lights most evenings over the last week. I thought I’d share a few here. I very much expected this moth to be one of the first out, but I’d already tallied more than a dozen species before it showed up. It’s called The Half-wing, Phigalia titea, its common name derived from the female moths which have stunted wings incapable of flight. It also comes in an all-black morph which is less common. This is a Three-spotted Sallow, Eupsilia tristigmata. Although not the first moth, this one was one of the earliest to turn up at the porch light this year. Since then I’ve had a few, which I’ve been pleased with. Prior to moving here I’d only seen one. The Eupsilias are all early-spring and late-fall moths, spending the winter as adults holed up in some snug spot. 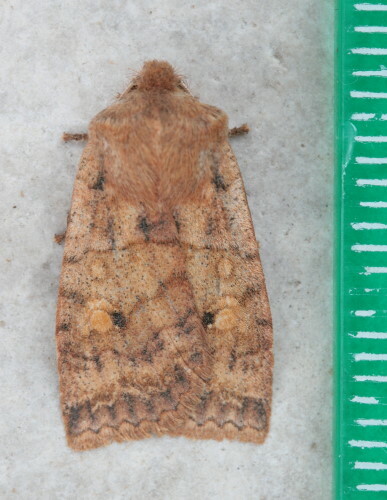 This is another Eupsilia, a Straight-toothed Sallow, E. vinulenta. 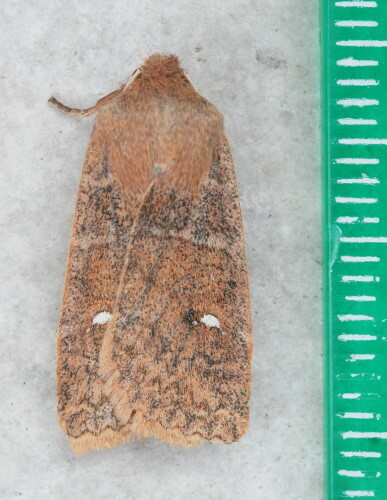 Or, at least, it could be a Straight-toothed Sallow. The only way to tell it apart (without dissecting it to examine the genitalia) from a couple of nearly-identical species is by the tiny “teeth” at the edges of the scales – on all the other species, these “teeth” curl. Most people don’t have the means to check this, and so any moth that looks like this gets labeled a Straight-toothed Sallow. It might be more appropriate to call it part of the Straight-toothed Sallow group… but that’s such a mouthful. The rulers shown in these photos are all displaying millimeters. The measurements are being used in the guidebook, but they’re also useful for conveying scale. This moth is a member of the micromoths, the group of moths that make up the first half of a taxonomic list. 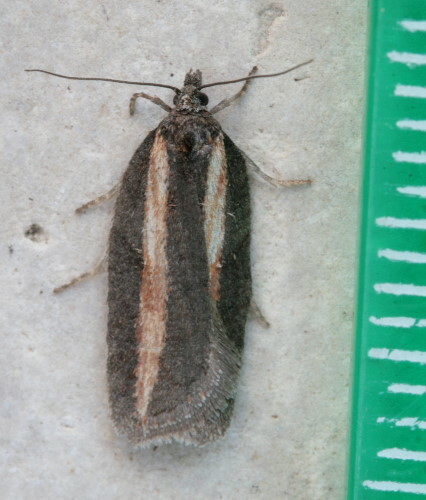 Much like birds are divided into “non-passerines” (the first half, taxonomically) and “passerines”, with moths we have micromoths and macromoths. I’m sure they fall into some sort of broad category header with a fancy scientific name, but I don’t know it. This one’s an Aurora Flatbody, Semioscopis aurorella. I’m not sure why they’re called flatbodies (beyond potentially the obvious). There are a few Semioscopis species, all of which are early spring fliers. Most of the time the littler micromoths get overlooked. They’re tiny, harder to see, and tend to be harder to ID both because the patterns have fewer distinguishing marks (less space and fewer scales to form marks with) and because there really hasn’t been a good guide to them. The best one out there is the Moth Photographers Group plates, which is online. None of the printed guides I own include micromoths. The new guide Dave and I are working on will have about 600 species or so. Hopefully this will help encourage interest in the group. It really is a shame that they’re underappreciated, because some of them have some nifty patterns and shapes. This one is Acleris hastiana (as a sign of how passed-over they’ve been, more than half of them don’t have common names, while nearly all macromoths have common names). 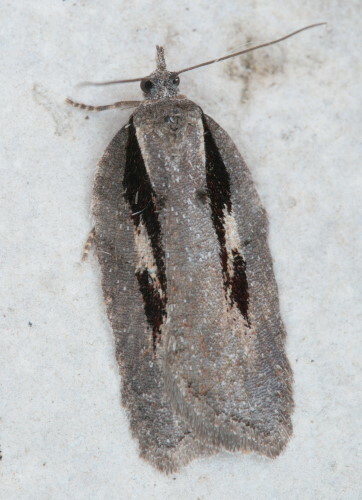 I think this one is also Acleris hastiana. It’s a rather variable moth, with some of the patterns of the adults looking like they really should be separate species. Most of them are pretty striking, though. All for now. I’ve been posting daily photos over at my moth blog to showcase some of the diversity of this group of organisms. Now that the moths are flying again, I’m going to try to post species appropriate to the date, whatever’s out and about. Swing by and check it out! I like the Aurora Flatbody. It looks like it is dressed in a tapestry shawl. Wow , I didn’t realize you had a moth blog. I have been taking photos of moths for years and strugglig with an old Petersons book to id them. This year I decided to try to keep up and identify them as they showed but and then do a blog about once a week with the ones I can name. I will definately be back to see if you are finding the same things. 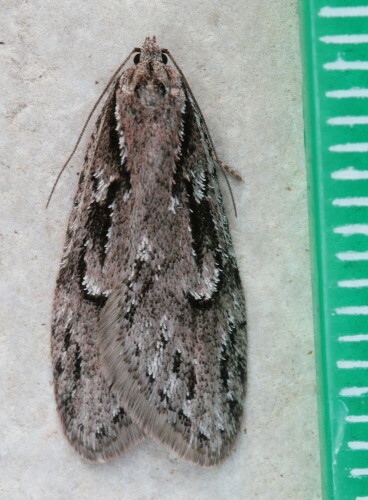 I found a The Half-wing, Phigalia titea and by the looks of it I got it right. Yours looks like mine. I think I might also have seen the Three-spotted Sallow, Eupsilia tristigmata.